The Rocks host Enfield this evening in a big Bostik premier clash at Nyewood Lane - and have two of the weekend's injured troops available. They have been hit by multiple injuries in recent weeks and Saturday's draw at Harlow saw young Pompey striker Brad Lethbridge go off injured - and wideman Mason Walsh follow suit after replacing him. But both are fit to start tonight's game - which is welcome because another Pompey loanee, Dan Smith, is on duty with the Blues as they take on Arsenal under-21s at Fratton Park. Smith is on the bench for Pompey, along with Leon Maloney, who has played one game on loan at Bognor, while Freddie Read, a teenage midfielder who has also appeared for the Rocks on one occasion, is in the Blues' starting line-up. 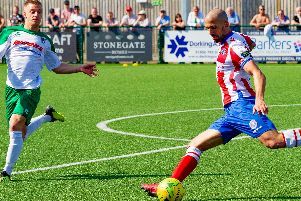 For Bognor, defender Gary Charman makes his fourth Rocks home debut in a game that sees Bognor try to work their way back in among the top four or five. Other than Walsh coming in for Smith in the starting XI it's an unchanged Bognor side.